A little history of the development of Cathedral by Bob Moore, from 1978. The Very first prototype model. After some experimentation the very first practical game was made from Balsa Wood. A limited number were made from plaster of paris, based on this design. All the basic shapes as they appear now were developed on this model. A very early production model was made in two dimensional abstract form. The Formal design proved so popular that the 2d version was soon discontinued. In 1980 the production of the flat frame three dimensional formal version looked much like this one, with oiled satin finish and NZ native Rimu frame with Tawa pieces. The playing surface was of Kauri plywood veneer. 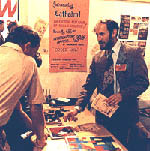 The author Bob Moore at the first public trade showing of Cathedral at the 1981 Easter Show in Auckland New Zealand. In 1983 Cathedral won the then prestigeous Designmark Award, for excellence in design and manufacture. In 1986 a quantity of plastic games were produced and they sold very well. These are likely to become a collectors item.